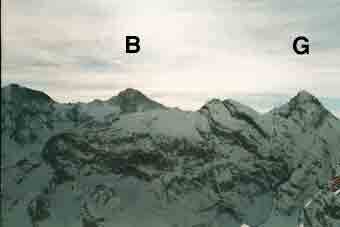 Mürren is on a shelf above the Lauterbrunnen (opposite Wengen) in the South arm of the Lütschinental. It is a fantastic location & the village is Car Free! 1. Fly to Geneva. Train to Bern via Lausanne. Then see the next. 2. Fly to Bern. Either walk to Belp Station & take the train to Thun, then to Interlaken Ost. Or take the airport bus to Bern & take the train to Interlaken Ost. 3. Fly to Zürich. Take the train to Luzern, then the narrow guage Brünig line to Interlaken Ost. From Interlaken Ost, take the narrow guage BOB line to Lauterbrunnen, the funicular to Grütschalp & the tram from there to Mürren. 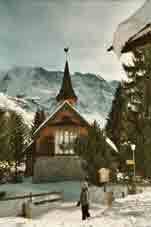 Or drive to Lauterbrunnen & park there. 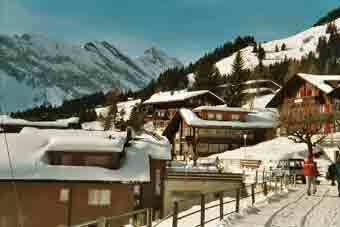 There are plenty of hotels on the Mürren web site (in English). To ski for the day from Lauterbrunnen of Wengen, get off the tram at Winteregg (1st station after Grütschalp) & take the chairlift there to get into the ski area. If you go on to town, you will have a walk! Ken has skied there but not stayed in winter. 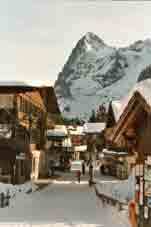 Unlike Wengen opposite, you can ski from the village. 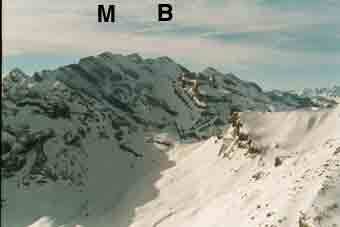 From the top of the Schilthorn, there is a 1,400m drop to the village! (Nice, wide steep black run from the top). 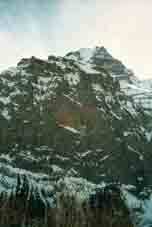 URL: http://www.art-science.com/Ken/Alpine/Murren/index.html Last revised 27/6/2008 © 1998-2008 Ken Baldry. All rights reserved.